Saturday will be dry, then we’ll see a coating to 3 inches on Saturday night, about 3-6 inches on Monday morning, and a stronger storm could bring 6-12+ inches on Thursday. Additional storms will likely bring snow from Saturday night through the following week. 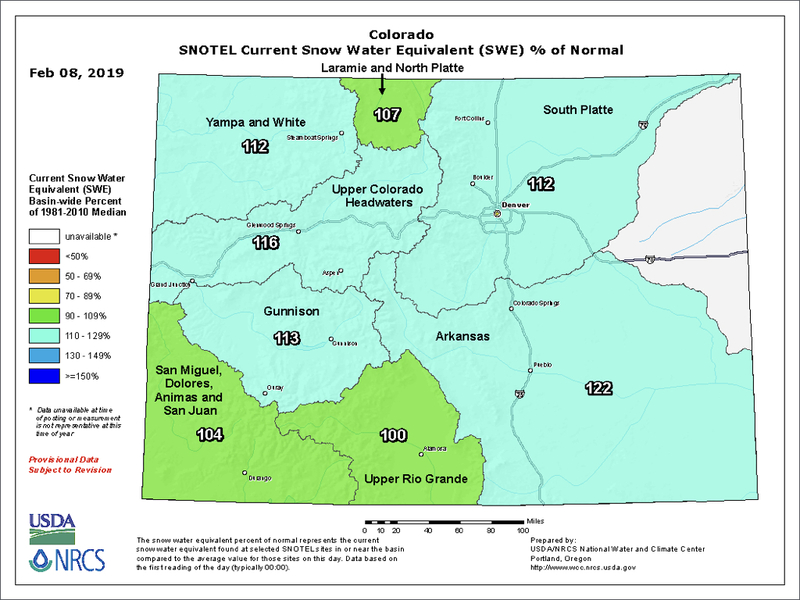 Now in early February, our snowpack is healthy across the state. All river basins of Colorado are reporting average to above average number (100-122% of average) as of February 8th! Looking ahead, I do not see any major updates to the forecast that I posted yesterday, and there is a bit more clarity around the chances for snow over President’s weekend. On Saturday, we will see dry and partly sunny weather. On Saturday night, we’ll see a quick-moving system bring light snow. The latest HRRR (High-Resolution Rapid Refresh) model shows just light amounts, about 0.10–0.25 inches of precipitation, mostly for the central and northern mountains. Using a 15-to-1 snow-to-liquid ratio, this converts to 1.5 – 4 inches of snow. So, maybe a fresh coating on Sunday morning, though not enough for a significant powder day. Then from about Sunday midnight through Monday early afternoon, we will see a stronger storm compared to the one from Saturday night, so I think 3-6 inches is a good bet for most mountains and we’ll likely have low-end powder amounts by Monday midday. On Monday afternoon, temperatures will become very cold, likely limiting additional snowfall due to the lack of moisture in a very cold airmass. Tuesday and Wednesday will likely be dry. Then the strongest storm of the bunch will bring snow from Wednesday night through Thursday night and most mountains will likely be in the 6-12+ inch range with the best odds of the deepest snow in the southern and central mountains. 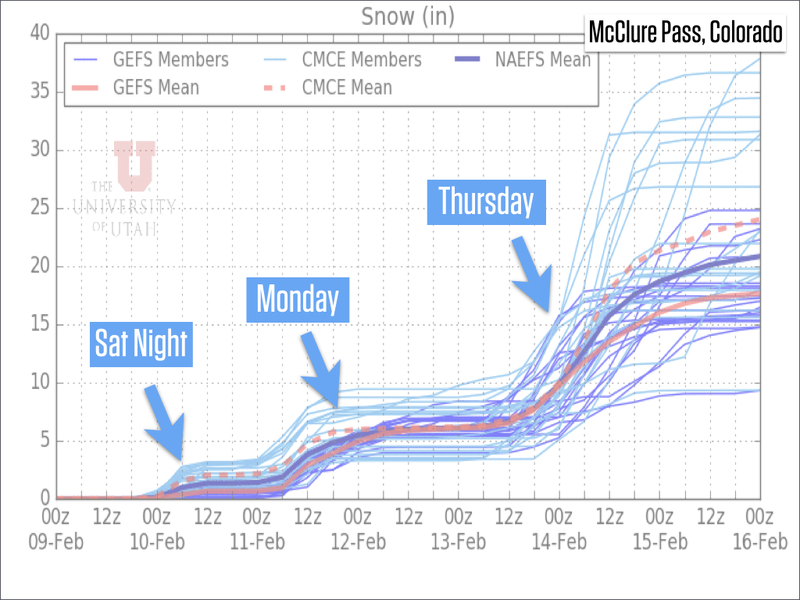 The University of Utah multi-model forecast is staying consistent for the central mountains with light amounts Saturday night, 3-6 inches on Monday morning, and then 12+ inches possible on Thursday. As long as this forecast holds, Thursday looks like a fun and significant powder day, and there could be leftover powder on Friday morning as well. I still think we’ll see a break in the snow from Friday late morning through Saturday afternoon. Then the flakes should get going again on Saturday evening and we’ll likely see multiple storms from Saturday night through the following week, at least until about February 24th. 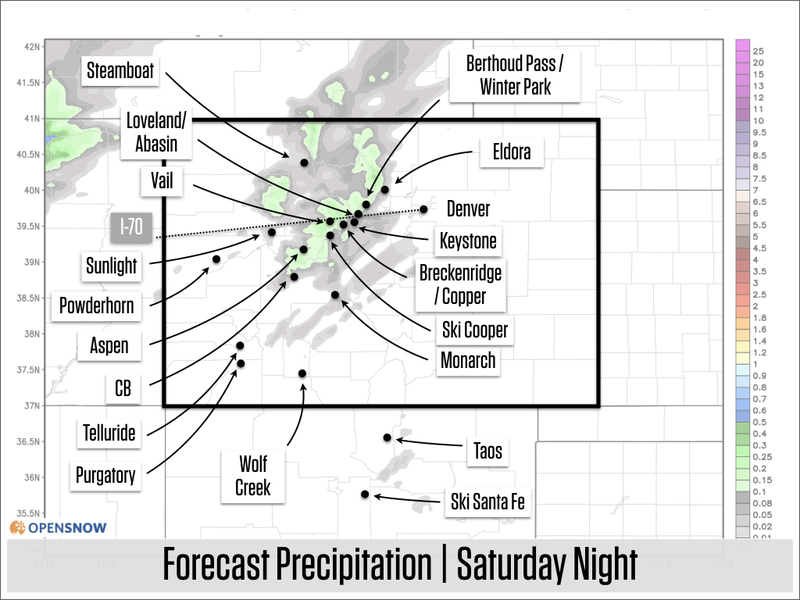 Even though it will not snow every day between Saturday, February 16th and February 24th, with an active pattern forecast by most models, we’ll likely have multiple powder days in that stretch. Really, this is about as good of a long-range outlook as we can hope for. My next update will be on Sunday morning.